SONAX Gloss Shampoo Concentrate 5L. Home > Shop By Brand > SONAX Car Care > SONAX Gloss Shampoo Concentrate 5L. Gentle on paint, safe on wax. 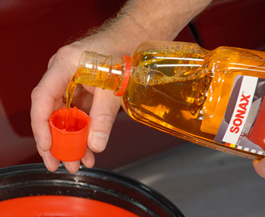 SONAX Gloss Shampoo Concentrate is safe for all paint finishes and will not strip away the wax already applied. The non-alkaline, non-acidic formula gently removes dirt, grime, and oil without diminishing the existing paint protection. The special anionic surfactants within, simultaneously adhere and distribute dirt particles and act as emulsifiers absorbing and dissolving oil droplets. Lubricating oils protect paint and glass from abrasion as dirt rolls off in the rinse water. SONAX Gloss Shampoo Concentrate produces rich foam with slippery oils that make this shampoo a pleasure to use. The ample lubrication in the formula is apparent by the way water sheets off the paint! Sonax Gloss Shampoo Concentrate is a great value. 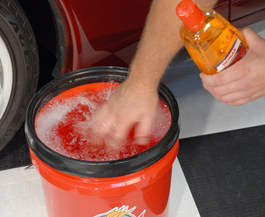 One capful produces ample suds and lubrication to safely clean your vehicle. For the best results, rinse your wash mitt or sponge often to release any dirt. Wash from the top down and rinse frequently. SONAX Gloss Shampoo Concentrate rinses clean and leaves minimal water spots. Towel dry with a Cobra Guzzler Microfiber Drying Towel to remove any remaining moisture. The clean finish will have an enhanced shine and slickness. SONAX Gloss Shampoo Concentrate produces a brilliant, clean shine every time! I have used Sonax for years and it's my favorite car wash product for use following a vehicle detailing. It does not strip the wax in short order as do some more harsh soaps. I always wash my vehicles with low pressure, two buckets and microfiber wash mitts to prolong the finish and Sonax is my choice. It is highly concentrated so a little goes a long way. Try it, I think you will like it.